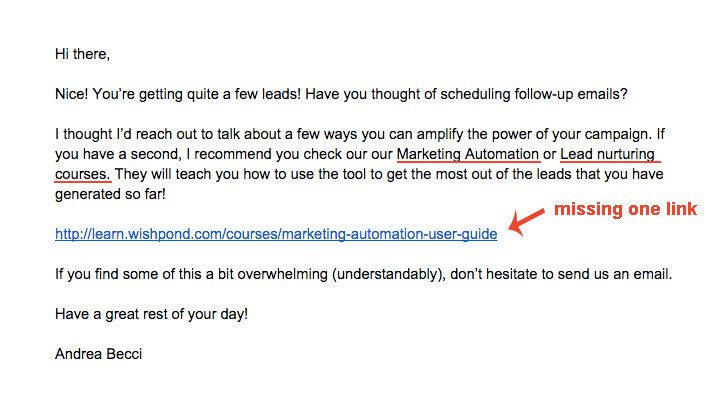 Lead nurturing is tough. The fact that 79% of inbound generated leads never convert can be a testament to that. But have no fear, there are tricks of the trade to help you turn more of those top-of-funnel generated leads into brand new customers. Here are 17 hacks that can help you turn your your lead nurturing jabs into conversion knockouts. Liquid is a coding language that can be used to dynamically change the content of an email depending on what you know about your user. By adding liquid "if" statements to the body of your emails, you can change entire sentences or sections depending on whether a user meets the conditions of your "if" statements or not. 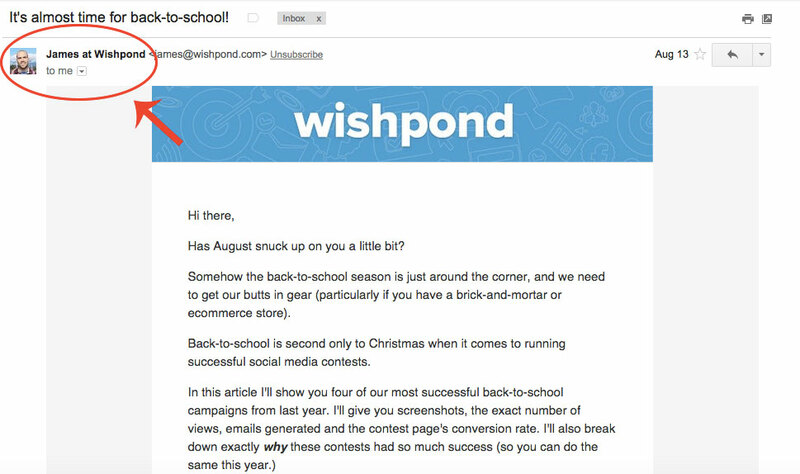 At Wishpond, we used to send all of our new leads a welcome email when they started building a campaign. 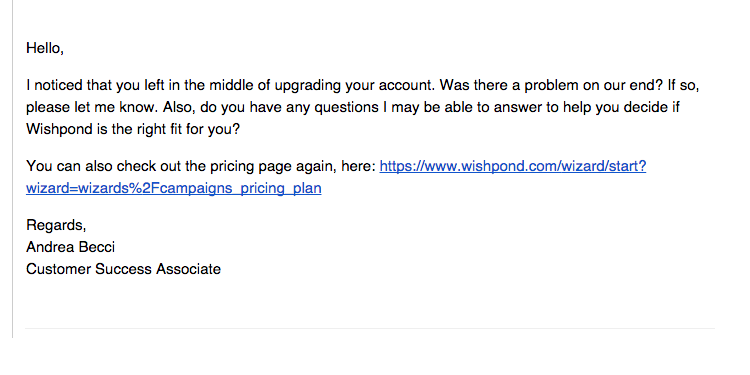 Regardless of what actions they took we'd send them all a generic lead nurturing campaign progress email with a link to our Wishpond user guides. In the past couple months, though, we started using Liquid to personalize those welcome emails, and we've seen awesome results. For example, if a lead had logged in and created a sweepstakes, we’d automatically send them an email with a link to a course on “How to build a sweepstakes”. 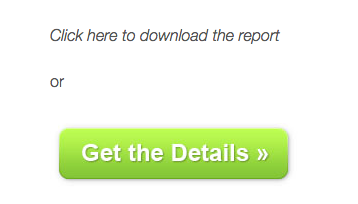 As a result we were able to achieve a 76% increase in the total number of email click throughs. People prefer to see content related to a subject they’re interested in. While it might take a little bit longer to set up, Liquid tags can increase the relevance of your lead nurturing emails and make your content much more valuable to your users. According to Forrester Research, proactive chats can increase your return on investment by 105%. Another lead nurturing strategy is to use proactive Live Chat invitations to ask users specific questions depending on what page of your website they are on. 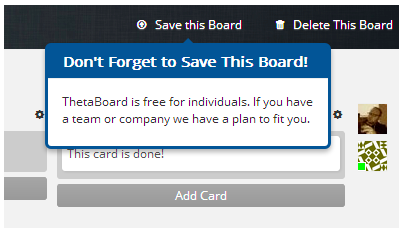 If they are on your pricing page this could be something like “Do you have any questions about our plans?" or if they are on your services page it could be “How can I help you get set up today?”. A study by Live Chat showed that visitors that were invited to chat were 6.3 times more likely to convert into customers than the ones who didn’t chat. And of those people who took up a pro-active chat, 61% of those customers converted within the first chat. 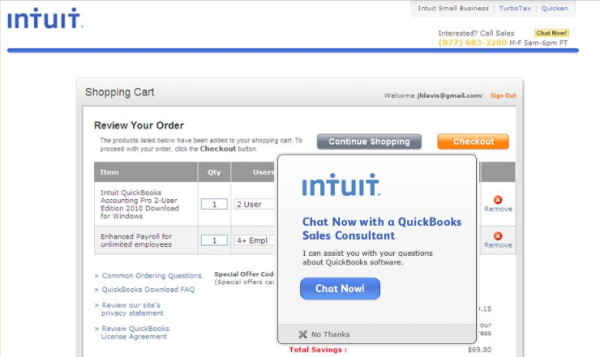 Intuit was able to increase their sales by 211% by adding a proactive chat window on their product comparison page. Their proactive live chat greeting was simple, "I can assist you with your questions about QuickBooks software". By making this small change to their lead nurturing strategy, they were able to increase their overall order value by 43% while simultaneously increasing their checkout conversion rate by 20%. 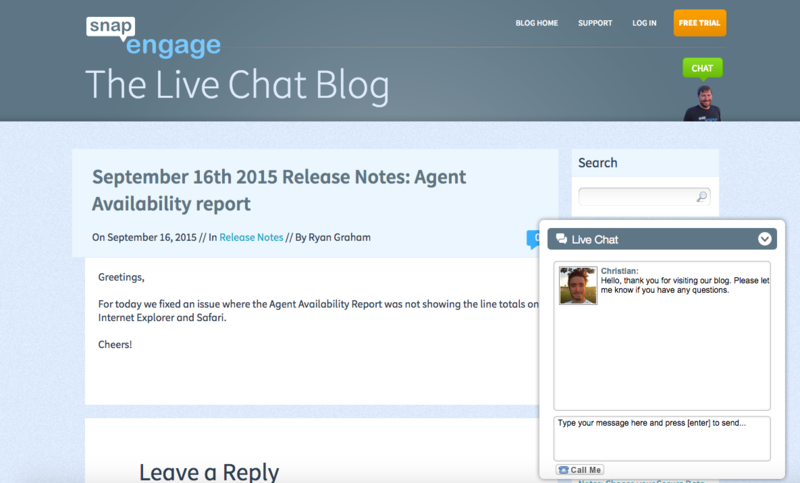 Setting up proactive messages is pretty straight forward if you’re already using live chat software. Simply ensure you have a set of proactive rules set up based on key pages of your website. These rules can include chat windows that appear after a certain amount of time, at a certain time of day, and whether they're a first time user, etc. Product Page - "Hello, can I help you with any questions about our products?" Pricing Page - "Hi! Do you need help choosing a plan?" Contact Us Page - "Hey there! Want to set up a time to chat?" 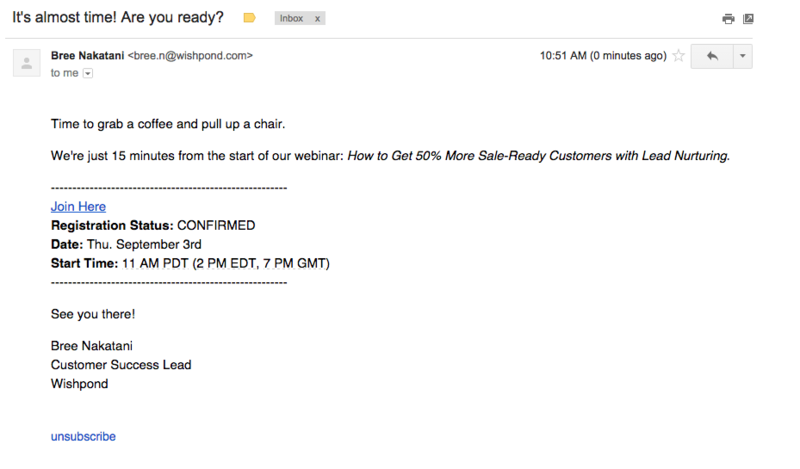 A pre-written email is used to help your leads convince their boss to buy something. Often times the person you are marketing to is a part of a much wider team, and their specific role within a company must be considered when creating content for your lead nurturing campaigns. Once your lead has been convinced about the value of your product, take the next step and make it easy for them to convince their decision makers of the potential upside as well. 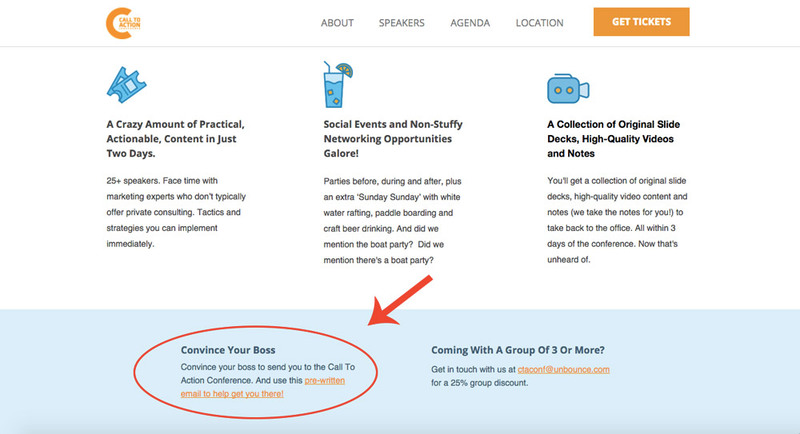 The marketing company Unbounce understands that marketers that want to go to their annual Call To Action Conference usually need to get the approval of management. Since their landing pages, website, and other promotional materials are all aimed at convincing the marketer, they still need to consider how they will convince the marketers boss. In the middle of their conference landing page, there is a pre-written email designed for marketers to send to their boss to convince them to let them go. Introduce your product and provide a time frame. Make it clear when your user should act by and provide a link to find out more. State the benefits of the product. 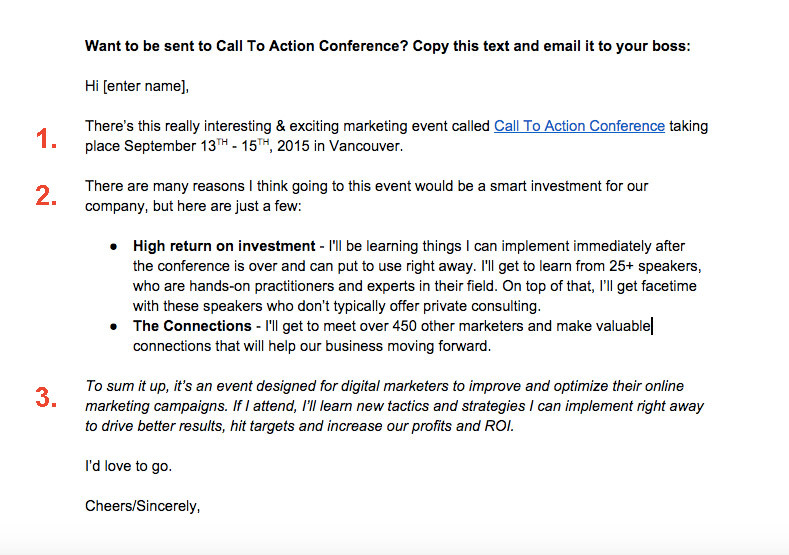 Use bullet points to reinforce your main value proposition, ROI, and key takeaways. Explain how the employee will benefit and how that will positively impact the company. When nurturing leads, it's important to understand who your leads are and the unique challenges they face inside of their companies. Once you’ve sold them on your product or service, give them the ammunition they need to sell it to the rest of their team. Early on in the lead nurturing process, starting a dialogue with your leads can be one of the most important factors in successful customer onboarding. 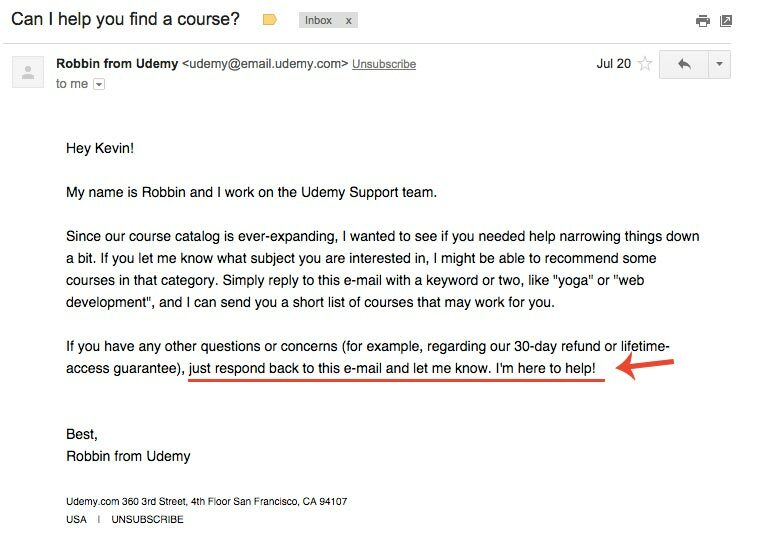 Try using “reply to this email” as a CTA instead of having a button or a link in order to get users to tell you about what they're looking for and some of the potential challenges they’re facing. And here's one from the stock photography company Twenty20 asking their leads what types of content they’d like to see produced in the upcoming months. Their call to action is simple: what type of images are you looking for? By posing a question as the CTA, these companies are able to start a conversation with their leads in order to identify how to serve them best. An oops I forgot to send you a link email is an automated email designed to replicate a human error made by a customer service agent. This two part strategy is used disguise the fact that you are automating emails, and can significantly impact email conversion rates. First you send an email with a couple links to content. Except in this email, you deliberately leave out one of the links you were talking about. Then you delay a follow up email by 25 minutes which includes the missing link as well as an apology. This will create the illusion that a real person made a human error and emailed back to correct it. 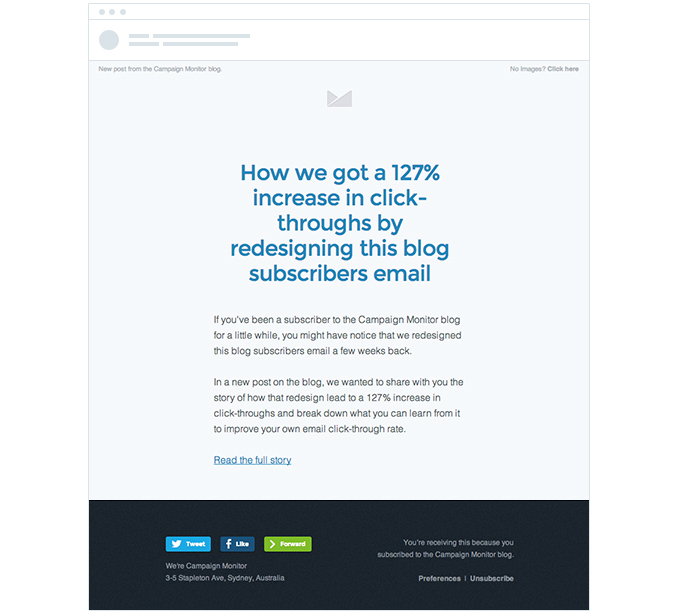 When we tested this strategy, we found that open rates and click rates remained around the same for both emails, but the conversion rate for the second email skyrocketed over 4X. Trigger an automated "oops" email when a user visits your billing or checkout page but doesn't end up converting. An "oops" email is an automated email that recognizes that a user had a purchase intent, but never followed through. Use these types of emails to draw leads back to your checkout page and get feedback regarding your products and checkout process. A question that asks if there was something wrong or if there is something that could be done to make their experience better. Once a user takes the time to complete one of your lead generation forms, optimize your post sign up pages to get a second conversion by providing another CTA. 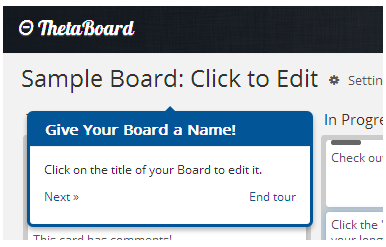 We use an arrow as a directional cue and bright colour CTA's that tell a user where to click. By phrasing our free trial offer as "step 2" of the page, it feels like the natural progression of events to download the book, then sign up for a trial. 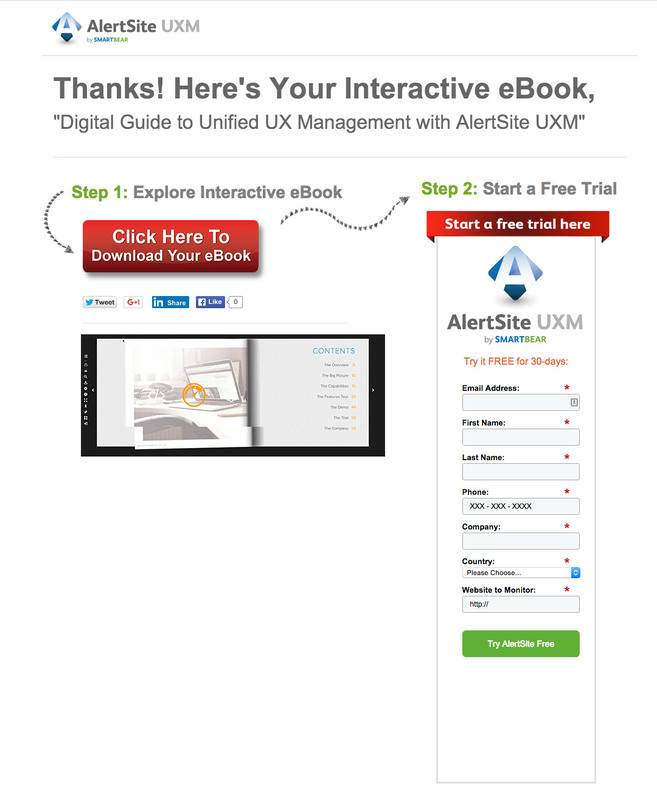 The company AlertSite UXM uses the same strategy with their post entry page ebook page. 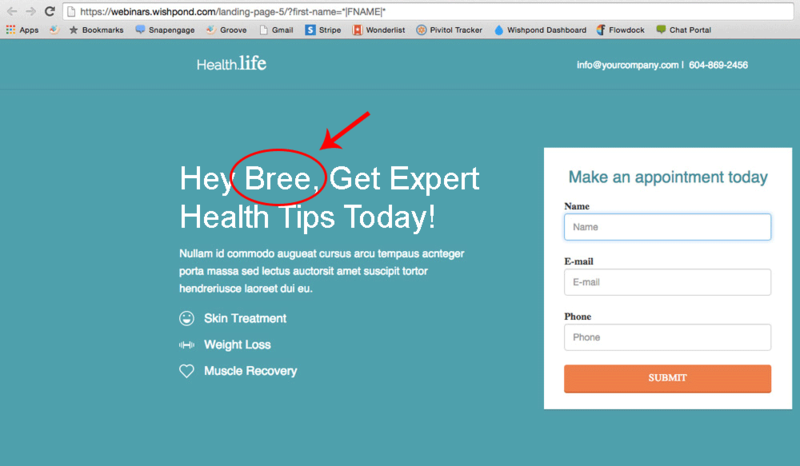 Notice how they have strong CTA's, directional cues, and also use a step-by-step method. By implementing this type of page AlertSite was able to significantly increase the number of trials resulting from content downloads. 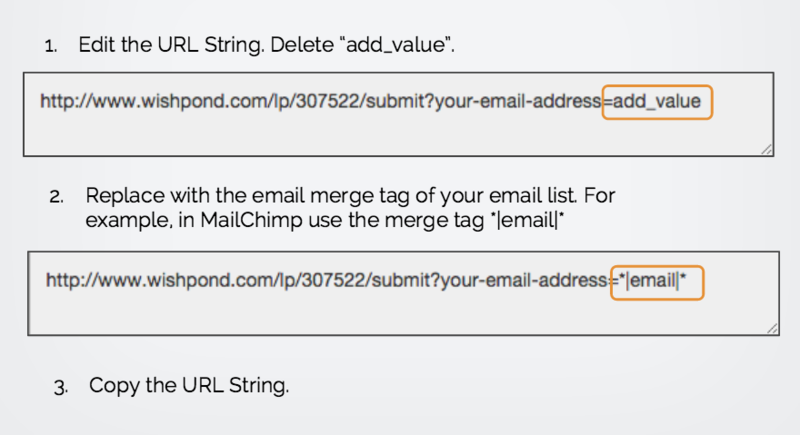 Replace plain text links with a CTA button on the bottom of your email in order to increase click through rates. Buttons have a way of drawing the eye with their size and color. This is especially true when contrasted with an otherwise white email. The exact position of the button will also matter as people prefer to scan content prior to clicking on a CTA. It’s been shown that positioning a CTA at the bottom of a page can have up to a 143% increase in click throughs compared to a CTA on the right of the page. 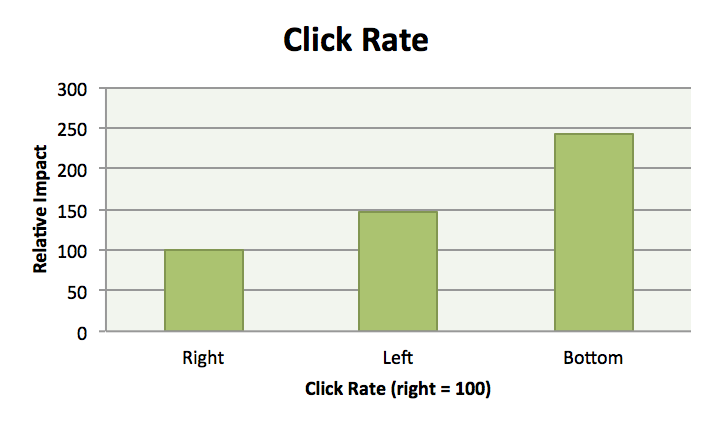 They were able to get a 28% increase in click throughs as a result of this test. 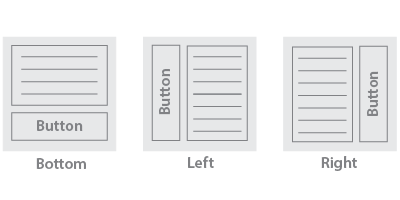 Buttons aren’t only for landing pages. Use them in emails especially when nurturing leads to make it easy for them to go from one part of your funnel to the next. Anytime you're providing a lead with a CTA, ensure that you make it visually clear where that CTA is. Position your button in an area where a user's eye will naturally go to after consuming your content, and watch your conversion rates soar. When users first visit your platform or app, there’s a solid chance they’ll get overwhelmed and end up leaving. Break down the different components of your platform or app into step-by-step chunks using an walkthrough. A walkthrough can help ease your lead's learning curve and increase signup rates. By simplifying the different components of your app you can help educate your users about where they are and what you can offer them. By walking users through the steps needed to get started, they were able to increase their free trial conversion rate by 46%. For more information on how to set up an App Walkthrough, Click Here. There's a number of reasons why people won't attend your webinar: it could be that they get busy with other things, decide they'd rather watch a recorded version, or simply forget. 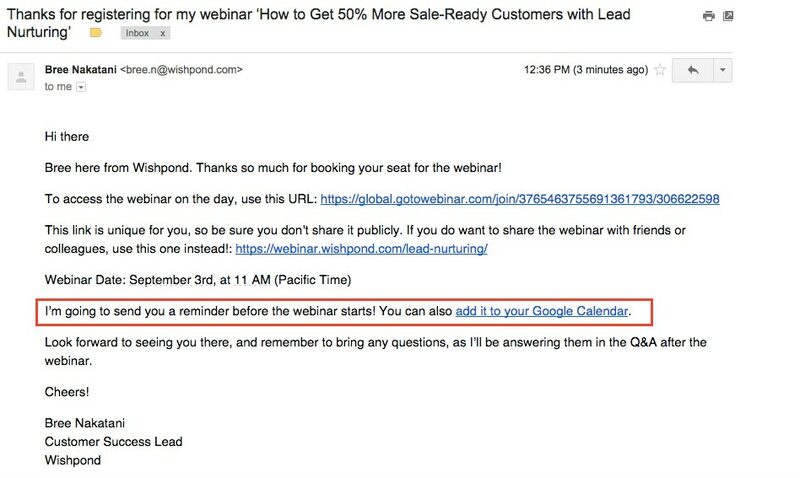 Reminder emails help you stay top of a user's mind once they’ve signed up for a webinar and will give them the link they need to attend. Send lead nurturing emails from different members of your organization based on the different roles they play at your company. Rather than sending mass emails from no-reply@business.com, send them from a person such as James at Wishpond, or Carly Smith in order to help keep your content fresh, especially if you’re planning on sending a large number of emails in a short period of time. This will help maintain the impression that the emails are personalized and will remind your users that your emails are coming from a real person and not just an automated emailing service. If your ‘from’ email address is a personal or business Gmail account, upload a photo to your Gmail profile as it will display as a thumbnail inside of your emails and will help reinforce who the email is coming from. Step 1: Click on the gear icon in the upper-right corner of your Gmail inbox. Step 2: Click “Settings” near the middle of the drop-down menu. Step 3: Click the “General” tab in the upper-left corner. Step 4: Scroll down and click the blue “Change picture” link above your thumbnail. It’s very common for a site to have a 60% to 80% bounce rate. Retargeting users who bounce immediately from your website (like in the first few seconds) is a waste of money for you, and annoying for them. Hide your retargeting cookies for 45 seconds to stop targeting users who bounce from your site in the first few moments. This way you can ensure that your retargeting budget is spent on people who actually take the time to stay on your page and consume your content. A simple strategy for this is to add a small piece of code to your website that unhides your retargeting cookies after a set amount of time. Implementing this hack, a marketer from imscalable.com was able to cut down 78% of his wasted retargeting ad budget. 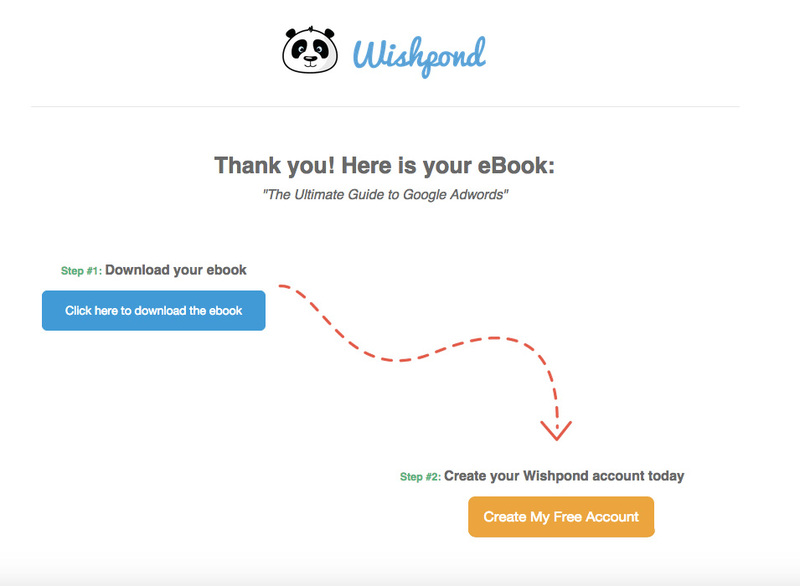 If someone downloads one of your ebooks and instantly gets an email from your CEO at 3AM, it’s obvious it's an automated emailhttps://www.wishpond.com/marketing-automation/ and a lot of the value associated with it is lost. Schedule a delay and ensure your email responses are sent between standard working hours (9AM - 5PM, Monday - Friday) in order to maintain the illusion that it’s a real email, from a real person. Take into consideration the time zone you are in and how you would be responding at those times. 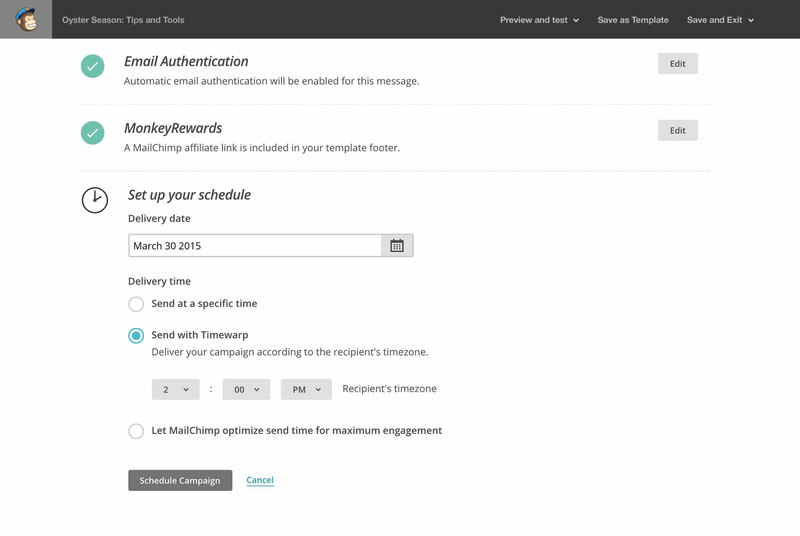 If you use Mailchimp, they have a feature called Timewarp which will allow you to send out emails between specific hours based on your lead's time zone. This way you won't have to worry about emails being sent in the middle of the night and can maintain delivery consistency across the board regardless of what time zone your users are in. 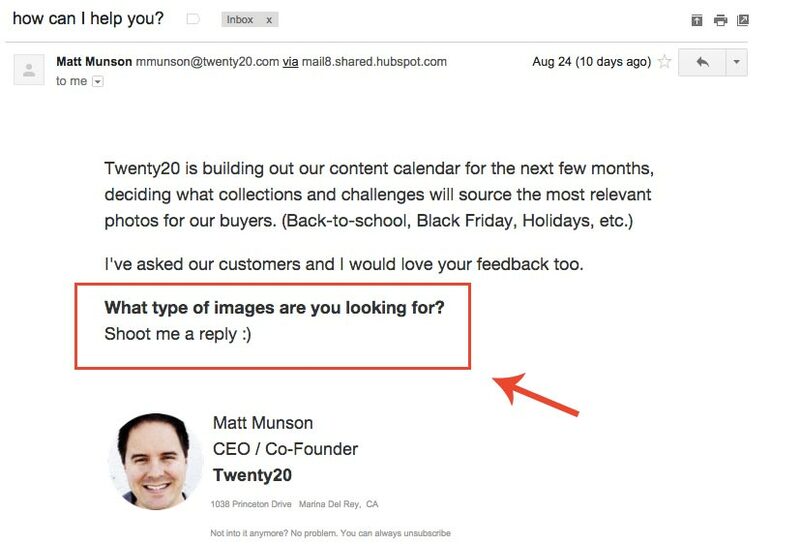 Other lead nurturing tricks to add to the level of realism in a personal response email are things like including a Re: or Fwd: in your subject line, as well as text at the bottom of the email that says “Sent from my iPhone”. Part of the lead nurturing process is making it as easy as possible for leads to make it from one stage of your funnel to the next. 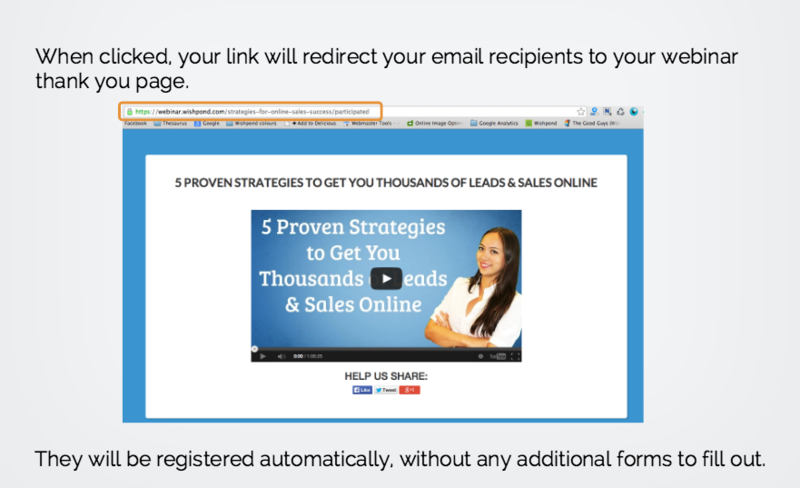 Use one click opt-ins to make it easy for your leads to sign up for your webinars. 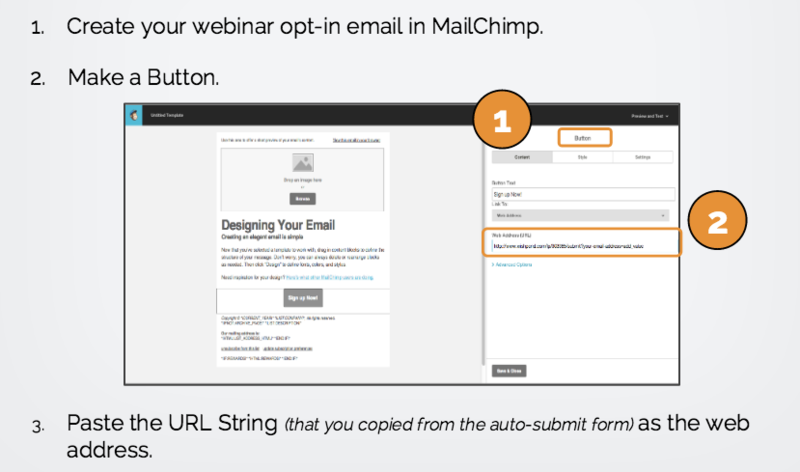 A one click opt-in will take information you already know about your users, such as their name or email address, and will pre-populate form fields so all a lead has to do is click one button in order to sign up for a webinar (instead of having to fill out another long form with information you already have). Under the form settings, ensure “Auto-submit form if all fields are filled” is checked off. 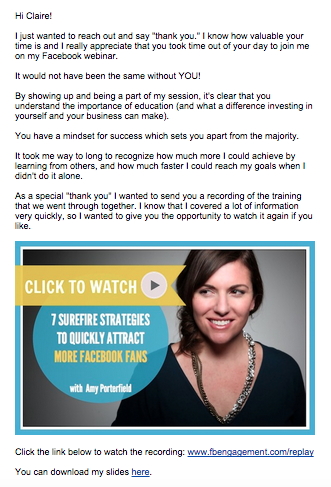 Even with the reminder emails I gave you above, since 40% of the people who sign up for webinars will never attend, it’s important to send them a personalized post webinar email containing a recording of the event. If you know your lead's name and you're sending them to a landing page, include their name in the landing page headline to increase the chance that they’ll convert. This can be done by attaching a merge tag on your landing page as well as at the end of your page destination URL. 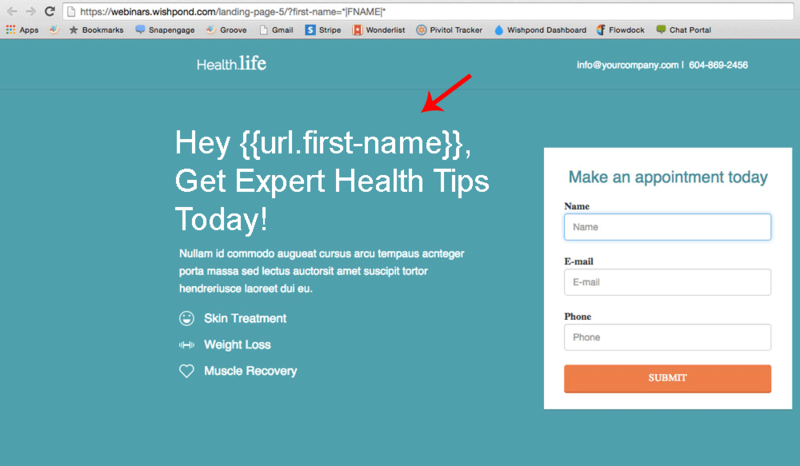 This is an example of what a merge tag would look like on your landing page. And this is the piece of code you would add to the end of your URL based on the merge tag of the email service provider you are using. 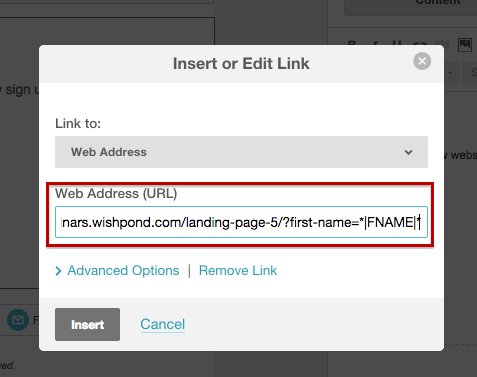 By adding that small piece of code to the link to your landing page, when users click on the link, they will automatically see a landing page headline that is personalized with their name. Instead of retargeting from your entire website or blog, try setting up a retargeting campaign based around a single piece of content such as a lead magnet or blog post. 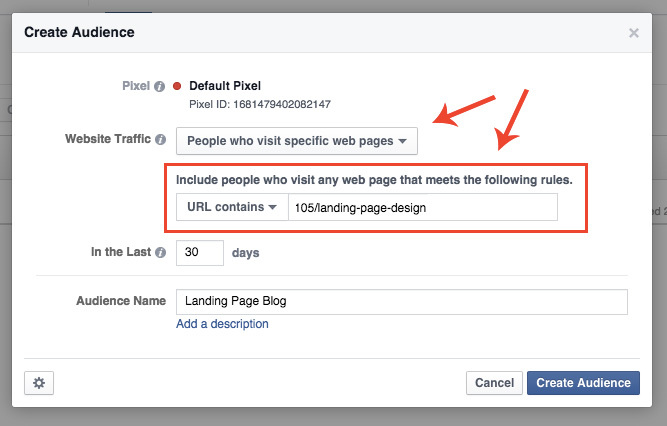 By setting up a retargeting campaign this way, you can ensure the content you're advertising to your leads is ultra-specific, and therefore increase the chance of engagement and conversion. 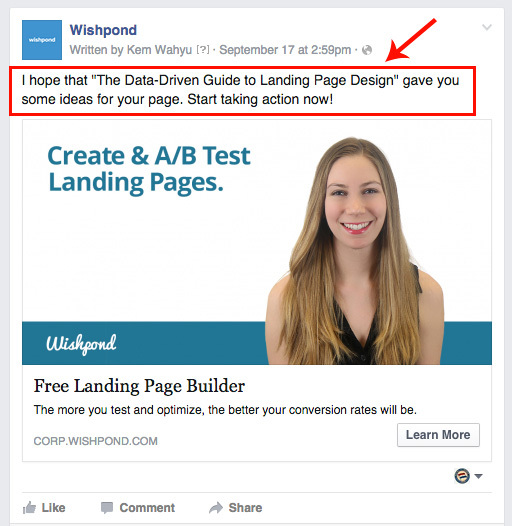 At Wishpond one content-specific retargeting campaign that we've run in the past was based off a blog post from one of our content writers Cara Tarbaj. 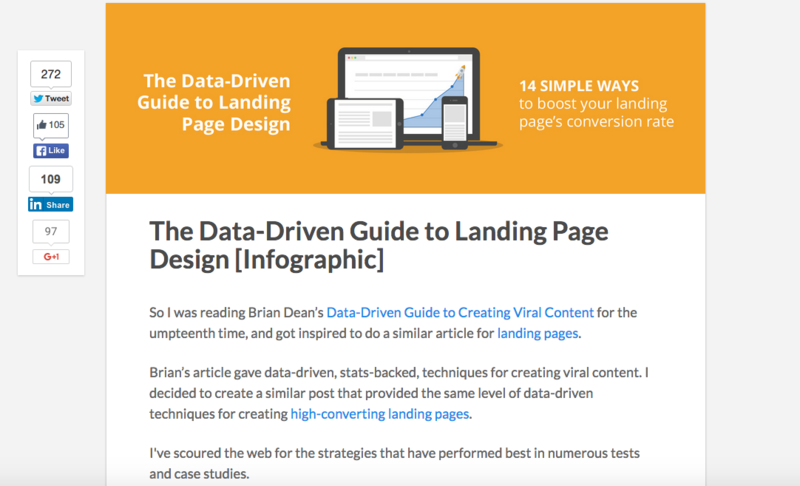 The post she wrote was called The Data-Driven Guide to Landing Page Design and featured an infographic with the 14 best ways to optimize a landing page for conversions. Our hypothesis was that if someone spent 10 minutes to read through an article focused on how to optimize a landing page, there's a good chance they'd be interested in building a landing page. Users that visited that post were then automatically put into a retargeting campaign targeted at getting them to try our free landing page builder. The photo of Cara, headline, and description all match with the content of the blog. This helps create a sense of familiarity with users who had already spent time reading the article. In this way the ad feels like a natural extension of the post itself and makes for a much more unified and personalized experience. 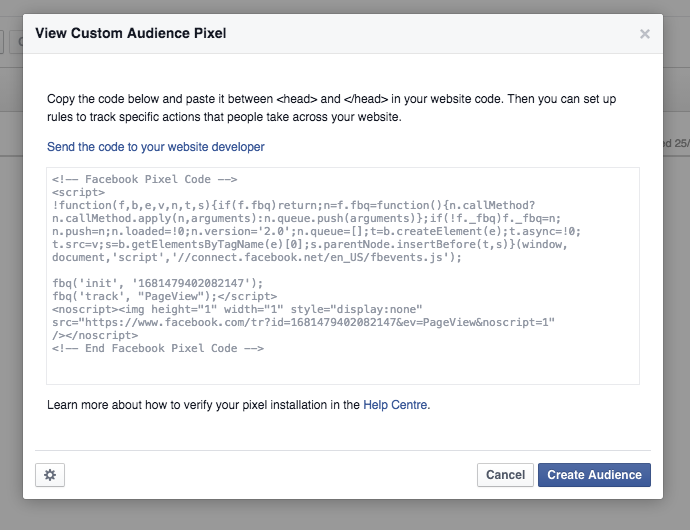 Step 3: Create a custom audience on Facebook based off users who have visited your content page. Step 4: Create your ads and monitor your ad campaigns. 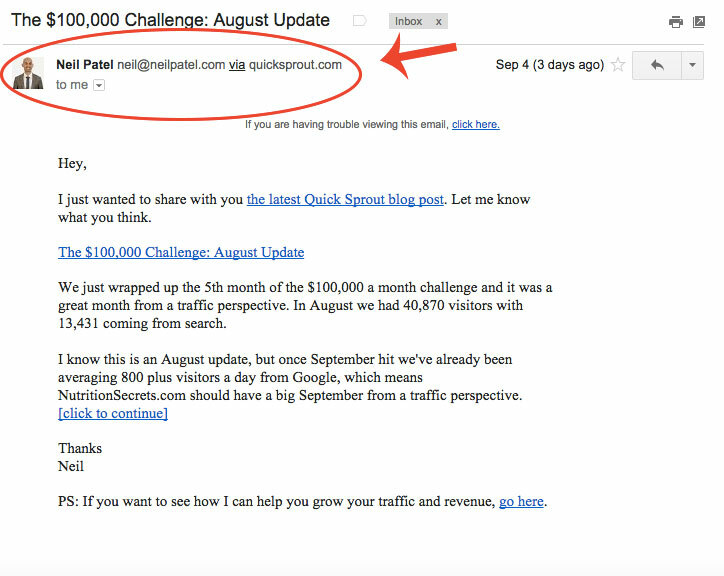 There you have it: 17 growth hacking knockouts to take your lead nurturing campaigns to the next level. Lead nurturing is as much of an art as it is a science. Experiment with these different techniques and see what works for you. What works for one business won't necessarily work for another. Remember to always test your assumptions to find your fastest route to conversion. 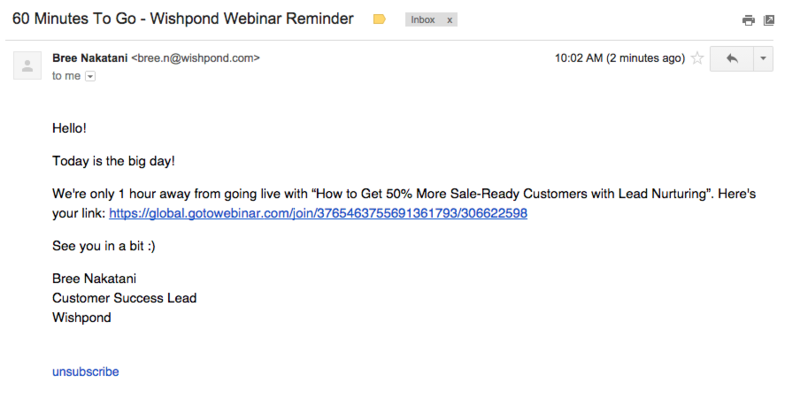 Have a favorite lead nurturing trick? Feel free to leave it in the comments below.